Observation - The Peregrine and the Pylon - UK and Ireland. Description: Have only been observing birds for a couple of years - some early advice I received was to always check out posts and pylons for perching birds. In this case a Peregrine on what appears to be a favoured pylon overlooking Greylake. Have only been observing birds for a couple of years - some early advice I received was to always check out posts and pylons for perching birds. 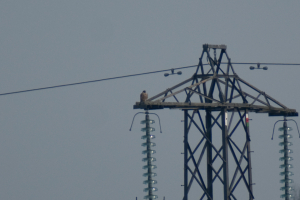 In this case a Peregrine on what appears to be a favoured pylon overlooking Greylake.